So this guide will help to make autorestart of MTA Server on linux Debian or Ubuntu (a daily restart improves server stability/minimizes lag). 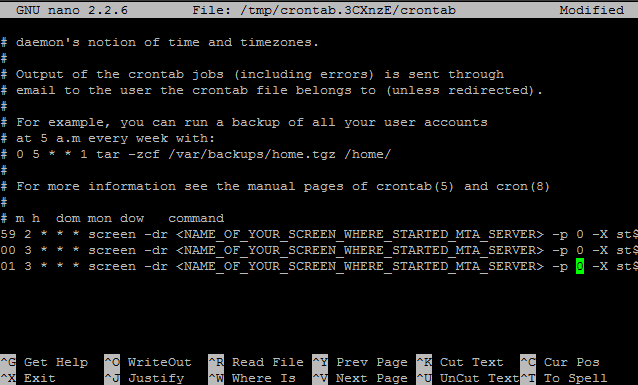 This works on all servers, so you need program called "CRON" to make autorestart. The program utility Cron is a time-based job scheduler in Unix-like computer operating systems. №1 Check to see if "Cron" is already installed. №2 If a path is returned, example: "/usr/bin/cron", then Cron is installed. Skip to №4. №3 Install Cron by typing. The syntax of each line expects a cron expression made of five fields, followed by a shell command to execute. 59 2 * * * screen -dr <NAME_OF_YOUR_SCREEN_WHERE_STARTED_MTA_SERVER> -p 0 -X stuff "$(printf "say Server will restart in 1 minute\r")"
00 3 * * * screen -dr <NAME_OF_YOUR_SCREEN_WHERE_STARTED_MTA_SERVER> -p 0 -X stuff "$(printf "shutdown\r")"
01 3 * * * screen -dr <NAME_OF_YOUR_SCREEN_WHERE_STARTED_MTA_SERVER> -p 0 -X stuff "$(printf "./mta-server\r")"
Now save file with ctrl+x click y then click enter. Now MTA Server Should to make autorestart every 24 hours at 03:00 Moscow time. If you have problems with this, send to this thread your problem and i will reply. You can install a web interface to cron too.